1. Aerate. When the soil under a lawn becomes too compacted, water, air, and nutrients have a hard time reaching grass roots. Lawn aerators correct this problem by pulling small plugs of soil about 1/2 inch in diameter and 2– 3 inches deep out of the ground. You can affordably rent an aerator for a day or hire a professional. 2. Reseed. If your lawn has bare patches or looks thin, reseeding is an easy solution. Start by contacting a local turf specialist to determine the best seed or sod to purchase for your location and soil type. Then, rake the bare areas of your lawn and apply seed. Water lightly and regularly until new grass grows in. While spring and fall are good times to seed due to cooler weather, it can be done any time of the year. 3. Mow High. Never cut off more than one third of the grass-blade height at a time. If grass gets too long, raise the height on your mower. Recommended mowing heights vary by grass type, but an easy rule of thumb for the most common types of lawn is to mow to a 2-inch height when the grass blades reach 3 inches tall. 4. Fertilize. 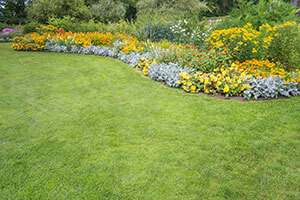 To keep your lawn healthy, aim to fertilize at least once a year; four times a year is ideal. Your local garden center can recommend the fertilizer best for your climate and grass type. Additionally, naturally fertilize your lawn by leaving grass clippings after you mow. As grass clippings break down, they enrich the soil with nitrogen, phosphorus, and potassium—the same nutrients found in fertilizer. 5. Irrigate. A thorough watering once or twice a week is better than lightly misting every day. Allowing the soil to dry before it is watered again encourages the roots to grow deeper into the soil and can help the lawn become drought tolerant in the future. What's more, water during the early morning and evening hours to avoid excess evaporation. Watering during the heat of the day can actually scald and burn grass. Learn more about quick, easy lawn improvement and maintenance tips at www.WeSeedAmerica.com or follow @WeSeedAmerica on Facebook and Twitter.